Judy Schwarz at End of Life Choices New York gave a great webinar (also recorded and archived) a few days ago on EOLCNY’s new advance directive for dementia. 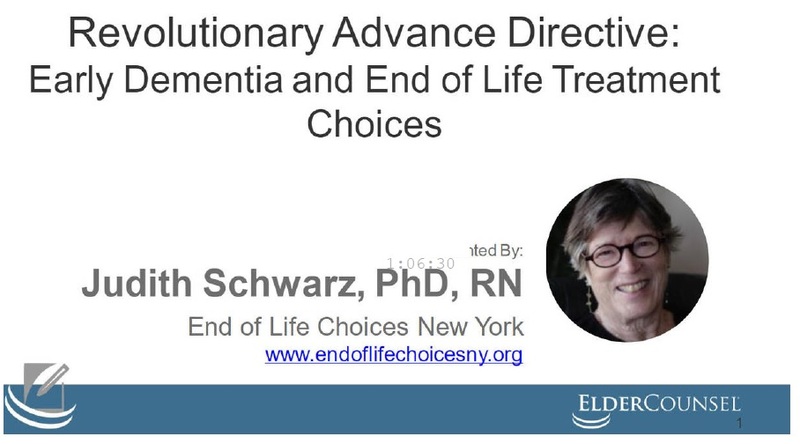 This unique written advance directive is designed for those with an early stage of dementia who wish to limit assisted oral feedings once their dementia becomes advanced, and they lose decision making capacity and the ability to self-feed. Coincidentally, this was the same day I discussed the legality of such a directive under Minnesota law at the MINNCLE Health Law Institute.